Elbrus Speed Climb competitions IV International ELBRUS RACE took place September, 16, 2008. Organizers were tourist company TOP SPORT TRAVEL (www.sklon.ru ) and mountaineering Internet site WWW.RUSSIANCLIMB.COM. The fourth time the strongest athletes came to Elbrus region to compete for the best result in speed climb to the highest Europe top.љ The general sponsor of the competitions was BASK (Outdoor equipment company). 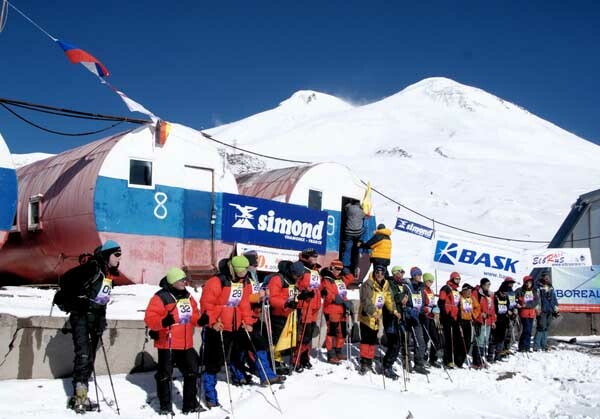 34 athletes were registered as Elbrus Race competitors - more than in previous races (2005, 2006, 2007) - it means that the race became more popular. They љarrived from Russia, Kazakhstan, Ukraine, Bielorussia, Germany, India and Indonesia. Russian climbers were from many different regions. Before the race all competitors were gifted by nice down jackets and caps by BASK. Elbrus Race competitions were supported by the Government and Sport Committee of Republic Kabardino-Balkaria (North Caucasus). Sponsors also were Tramontana (Outdoor equipment shop in Saint Petersburg), Top Sport Travel, Russianclimb.com, Elba Hotel (Elbrus region), Elbrus Cable Car Station, Bochki, S10 company, transfer drivers Muhud Baidaev and Olga Shuvalova. September, 15 competitors took part in "qualification" short race till Pastukhov Rokcs. According to regulations, they had to climb to the point in 2,5 hours. Not all members could do it - some of them were not acclimatized well. 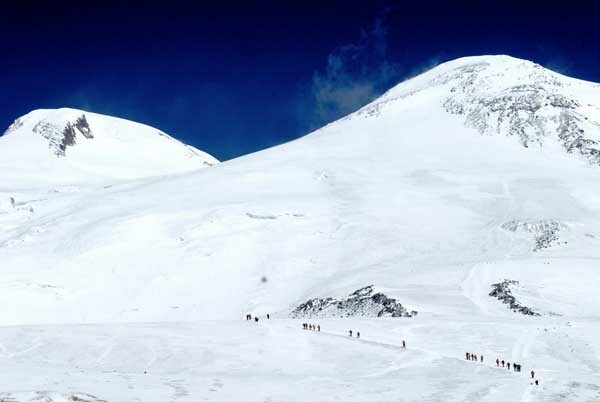 So only 26 athletes could start in Elbrus West top next day. The date of the Race was changed from Sep, 17 to Sep, 16љ due to the weather forecast: the weather changes were predicted to Sep, 17 after the midday, so organizers decided not to risk of safety of competitors and high-altitude marshals during their descent from the top. And Sep, 16 was a nice clear day. In the night, Sep, 16, 2-30 a.m. high-altitude marshals team, led by Tatjana Timoshenko, went by ratrak from Bochki (37008) to Pastukhov Rocks (4200). 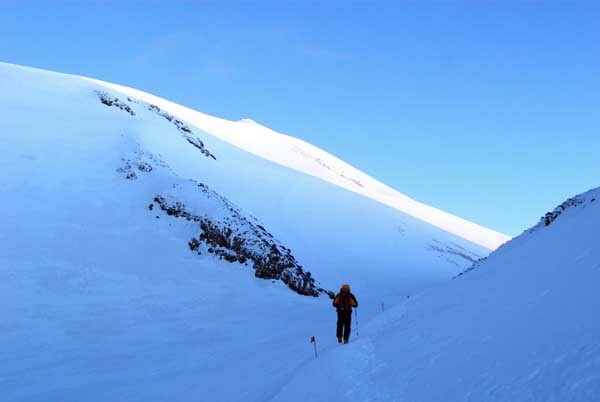 They had to climb further to Elbrus Col in the very strong wind early morning. They set the tent on the Col, prepared the hot tea for the competitors. Alexey Lonchinsky and the famous Russian mountaineering doctor and photographer George Rudenko also worked there. 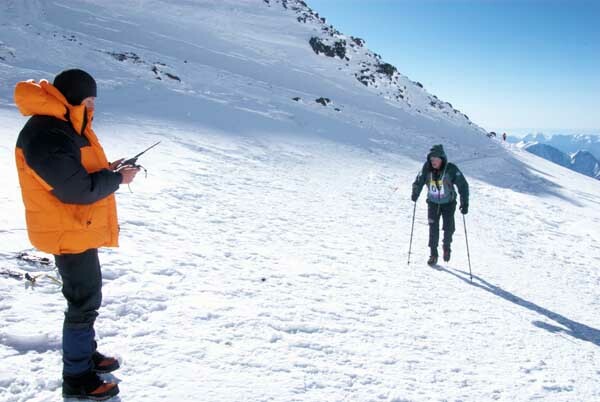 Vladimir Milanov and Mikhail Osipov waited climbers on the Elbrus West top (5642m). Cameraman Vladimir Kochurov worked on Pastukhov Rocks. Other two cameras worked on the start and on the top. On the Saddle: Serguey Fursov is coming! Not far above the Saddle - the most hard part of the climb! Due to the fine weather and experience all competitors descended successfully after reaching the top. 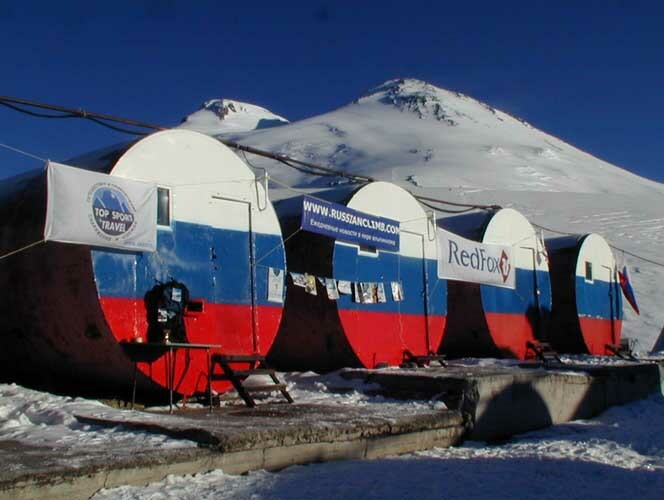 Elbrus Race was under the patronage of Elbrus Rescue Service. 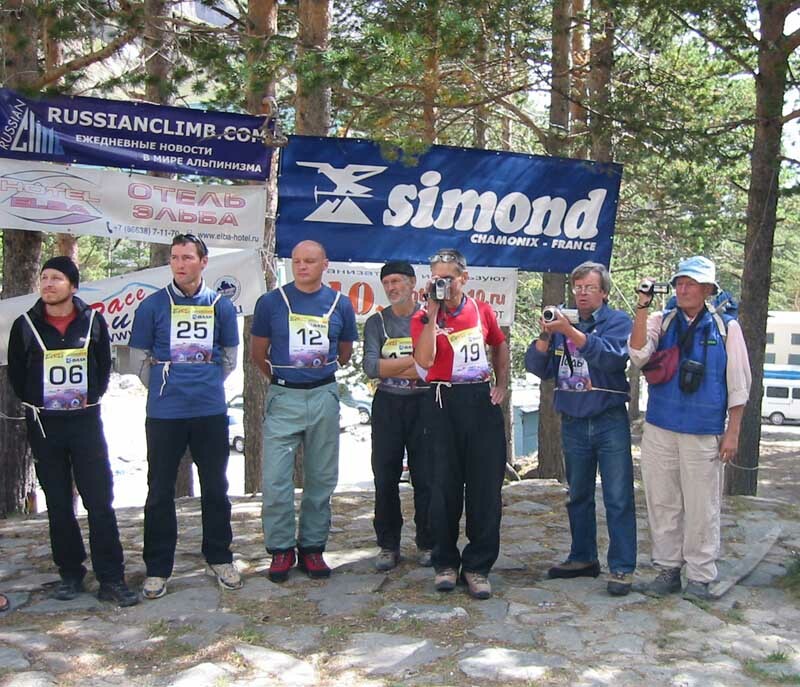 Four athletes started in Extreme class: from Elbrus bottom (Azau, 2400) till West Top (5642 m). Three of them - Roman Gubanov (Teberda, Caucasus), Victor Kamenskih (Lysva, Perm region) and Vladimir Kouznetsov (Samara) took part in Elbrus Race for the third time already. 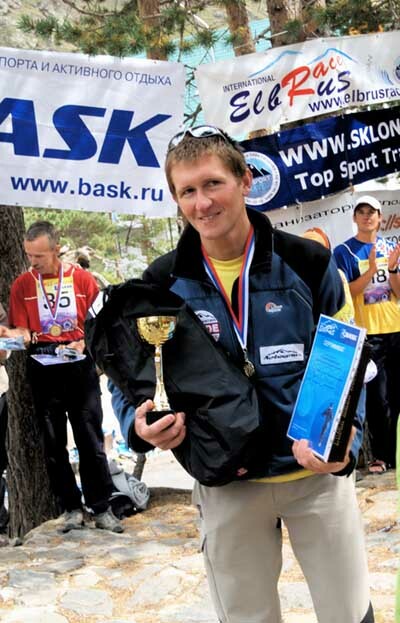 The fourth was Andrew Mariev (Togliatti) - he is well-known high-altitude mountaineer, he climbed Everest North Face in 2004, K2 West Face in 2007. At 6 a.m., Sep, 16, some minutes before the sunrise, these four courageous men started for the long way to the top, more than 3000 m altitude difference race. And some hours later all of them had reached the top! The first, who had reached Elbrus West top in Extreme class, was Roman Gubanov (he's also known for his K2 climb in 2007, Abrucci Ridge) - his result was 4 hrs 53 min - very good result! In 2006 Roman run in Classics class from Garabashi (3708 m) and his result was 3 hrs 07 min 07 sec, in 2007 he run from Garabashi in 2 hrs 51 min 38 sec. The second in Extreme class was Andrew Mariev - his result was 5 hrs 47 min. 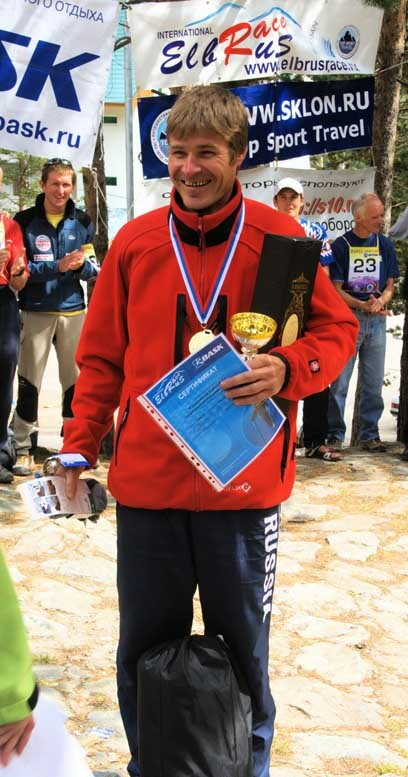 The third place took Vladimir Kouznetsov - 6 hrs 08 min 40 sec. In 2005 he had run from Garabashi to the West op in 7 hrs 05 min. in 2007 - 4 hours 19 min. The fourth place took Victor Kamenskih - 6 hrs 20 min 35 sec. In 2006 Victor run from Garabashi in 4 hrs 29 min 45 sec, in 2006 he tried to run from Azau, but didn't reach the top (run till the Sadde). The second place in "Classic" took Yuri Klim (Ukraine) - 3 hrs 15 minutes. The third place - Serguey Kolyshev (Moscow region) - 3 hrs 36 min 23 sec. The only woman, who could reach the summit, was Anna Petrova (Prohladny) - her time was 4 hrs 38 min! She already took place in Elbrus Race in 2006, but she wasn't lucky: she reached the Col 12-05, only 5 minutes after control time, and was obliged to descent. And now she had great result! September, 18 was the Elbrus Race closing ceremony.љ Winners got great prizes from BASK, BOREAL, SIMOND, TRAMONTANA, and the special prize from Russianclimb.com - $1000 for the Winner in Extreme class. The oldest competitor - 74 years-old Boris Korshunov - has got the special prize from BASK! Boris' result was 5 hrs 32 min 30 sec (from Garabashi), but he run without acclimatization, because he came from Moscow only the day before the race. Every ELBRUS RACE competitions are the important experience. It must be analised and used for the future competitions. This year race showed that, beside of Extreme and Classic,љ we need the third class with another regulations for competitors - special for newcomers, who only want to try to take part in Elbrus Race.љ Organizers will do their best for every athlete will find his interesting part in future Elbrus Race in 2009. 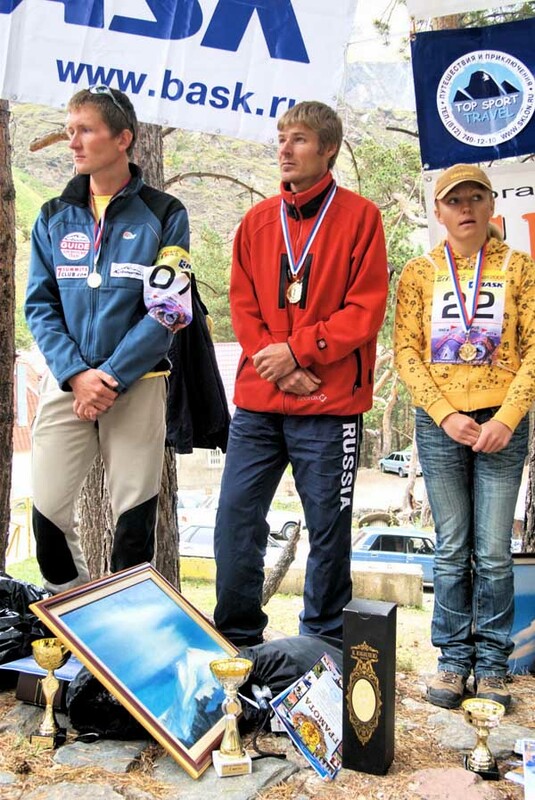 Serguey Fursov, Roman Gubanov and Anna Petrova (the Winner among women).